New York University’s Game Center is one of the leading incubators for creativity within the game design community. Every year, dozens of young game designers come through the program with big new ideas about what a game can be. 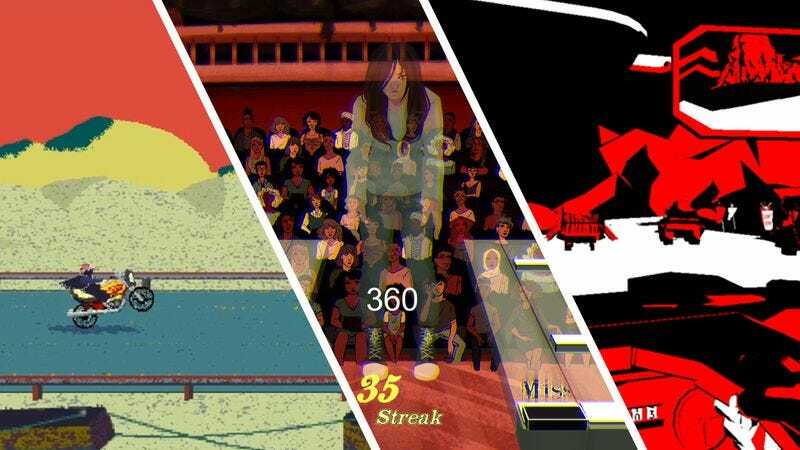 Recent Game Center successes include Nina Freeman’s How Do You Do It?, James Marion’s Peter Panic, and Zeke Virant’s Soft Body. We visited the 2016 student thesis show to see what types of games we could expect to see as critical darlings in the next few years. One of the brightest and loudest attractions of the night was Dire, a first-person death racing survival game with a severe style. Equal parts Mad Max and Sin City, the game has players driving a deadly drag race against burly spiked machines on a winding desert road, relying heavily on their rearview mirrors to stay in one piece as long as possible. The duotone graphics are an eye-catching black, white, and red, with the saturation dulling as players take damage until the road lulls into a dry and sad gray. Support for the Oculus Rift VR headset helped draw a crowd to the demo setups, as the promise of watching this post-apocalyptic highway rip apart around them was too much for people to resist. A quiet mass huddled in a darkened side room for demos of Stage Fright, a horror-themed piano recital simulator. The three-stage demo played like Guitar Hero for piano, with jewels coming down a six-note highway and a bored grade school auditorium in place of throngs of adoring fans. The hook comes from the game’s jump scares, which are triggered by specific parts of the songs and missed notes. The auditorium would suddenly be washed in red and black. The note highway would abruptly flip upside down. RGB values would split as though the screen were tearing apart. And most shockingly, a ghostly girl would appear on stage in front of you, staring directly at the player. There was clearly a larger narrative being told here, and Mauricio Juliano, one of the game’s designers, told me to expect a full game with a complete story sometime this fall. One of the biggest and most excitable clusters of the evening surrounded 3 Nights In Chicago. This two- to four-player heist-’em-up played like a mix between Smash Bros. and Ocean’s Eleven, with teams of two hopping across platforms, cracking safes, and getting the loot back to their getaway cars. The ability to bash one another at any time meant that players picking locks were easy prey for nimble grunts, so effective teams tended to have one player defending their safecrackers from attacks. The teams can break into any safe, but they have to return what’s inside to their designated car, so making a clean getaway was often the most frantic and contested part of any round. Teams can also spend part of their spoils to upgrade skills between rounds, but since your final score is based on how much loot is in your possession, spending any of it can be a big risk. There was an organized tournament around Epitaph, a turn-based combat game with two standout twists going for it. The first was that combat played out in real time even as characters were cooling down from their last attack, meaning that a steady stream of upcoming moves kept stacking up in a queue. This often meant giving your team commands three or four turns in advance, with little opportunity to consider how the opponents’ actions would interact with your own. Sometimes you’d luck out and the enemy would walk right into your swinging scythe. Other times, the enemy might spin you around before you get a chance to readjust, causing you to attack your own team. The second twist, which the game lifts its name from, was that each character gets stronger after they die. With five lives apiece, and stat increases with each death, combat gets fast and furious toward the end of each bout. With these two features combined, Epitaph proved to showcase the most unpredictable turn-based combat I’ve ever seen. Black Emperor is a fast and stylish game that built a crowd as the evening progressed. Taking inspiration from 1970s Japanese motorcycle youth culture, the game puts riders on a barren highway and tasks them with getting as far as they can. With a single finger on the touchscreen, players accelerate and steer up and down, trying to just stay on the road and on the screen. Rapid flashes of psychedelic symbols and large blocks of kanji text made wipeouts impactful and intense, goading players into “one more run!” again and again.